The Star Trac E-TR treadmill is pre-wired for personal entertainment devices and features integrated iPod® plug-in plus a handy USB charging port. The Intellitrac LED display tracks speed, time elapsed, distance, incline, calories, HR, and more. It also includes a 20-character message window, plus scrolling feedback on time remaining, vertical distance, and a ¼ mile motivational track. With 12 preset programs, you get dynamic heart rate control, fitness test, firefighter test, and military protocol programs. Wt / Dimensions: 400 lbs / 85" x 34" x 60"
The Star Trac E-TR treadmill features a custom aluminum uniframe and a 5 horsepower AC motor. It has SoftTrac cushioning suspension and a 1-inch thick reversible composite fiberboard deck. The belt runs over large 3.5-inch rollers with sealed bearings. Other features include a 500-lb user weight capacity, an incline up to 15% in 0.5% increments, and a speed range is 0.5 to 15 miles per hour in 0.1 mph increments. The E-TR is the entry level model of Star Trac’s E-Series line which focuses on entertainment features. The treadmill has integrated iPod connectivity along with a USB port for charging your devices. It also has pulse grip and Polar-compatible heart rate monitoring, cup holders, and adjustable cooling fans. 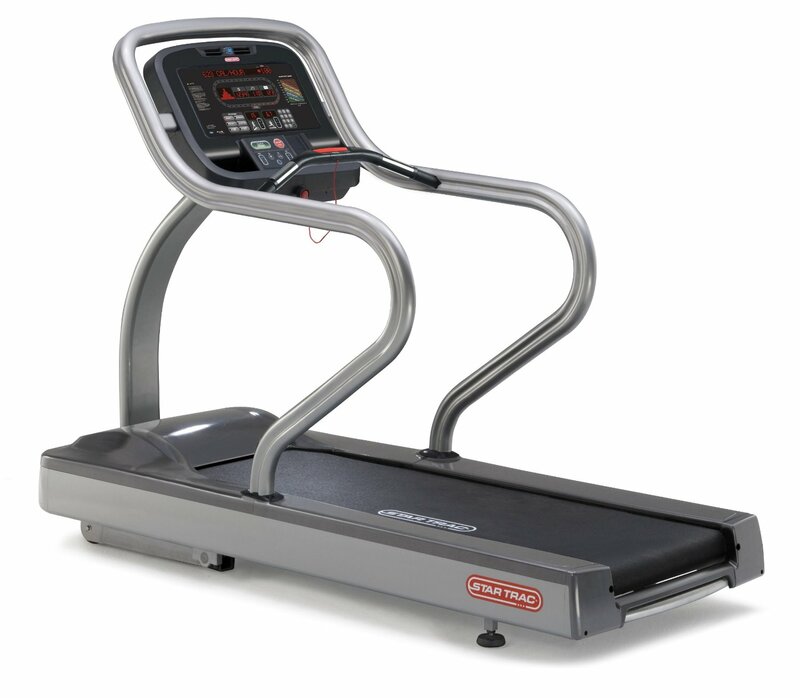 This Star Trac treadmill is a solid machine that will give you hours and hours of heart-pumping cardio workouts. 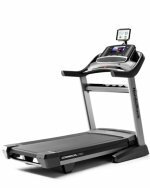 Reviewers rate the E-TR off the charts for performance, reliability, and comfort, so the only question to ask is, do you really need a commercial treadmill (designed to be used 16 hours a day) for your home gym? Companies like Landice, Life Fitness, and Precor offer better warranties, but this E-Series beast has the biggest motor of them all. There’s really no downside to it, just don’t pay too much: we’ve seen the Star Trac E-TR treadmill selling online for as high as $6,699 and as low as $4,995 so shop around with that price disparity in mind.